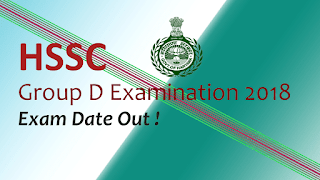 Haryana Staff Selection Commission(HSSC) release exam date of Group D Examination 2018. Haryana Staff Selection Commission(HSSC) released exam date for group D examination 2018. HSSC conduct this exam offline(OMR Sheets based) for all post of Group D examination against Advt. No. 04/2018, Cat. No. 01 of various Departments, Haryana on 10.11.2018 (Saturday), 11.11.2018 (Sunday), 17.11.2018 (Saturday), 18.11.2018 (Sunday), from 10.30 A.M to 12.00 Noon (Morning Session) and 3.00 P.M. to 4.30 P.M. (Evening Session). HSSC earlier notified more than 18,000 vacancies for Group D examination. And Now examination for the same, will be conducted from 10th November 2018 to 18th November 2018. Candiate can download Admit Card for HSSC Group D Examination from 29th October to 07th November 2018 as per their exam schedule. 75% weightage for General awareness, Reasoning, Maths, Science, English, Hindi or Concerned or Relevant Subject as applicable. If no person from among the applicant's father, mother, spouse, brothers and sons is, was or has been regular employee in any Department Board/ Corporation/ Company/ Statutory Body/ Commission/ Authority of Government of Haryana or any other State Government or Government of India. If the applicant is the first or the second child and his father had died before the applicant had attained the age of 15 years. There shall be no Interview /Viva-Voce.